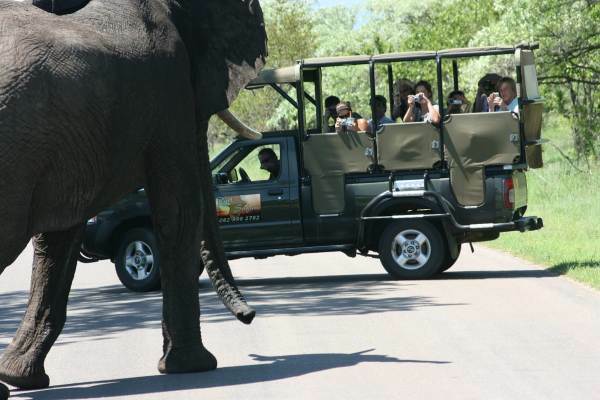 An overland tour taking in some of Southern Africa's most popular destinations. Explore Cape Town , the Namib desert, Etosha, the Okavango Delta, Chobe, Victoria Falls and Zimbabwe. This is a popular tour and recommended. Our adventure begins in Cape Town - the Mother City. After checking into our accommodation we begin exploring this amazing city and surrounds. There are loads of included activities, such as a visit to the Cape of Good Hope, a Table Mountain hike and wine tasting. For those wishing to get more active, there are many optional activities available - for example, shark diving, paragliding and Robben Island. We depart Cape Town and take a scenic drive along the West Coast. We spend the evening on the coast and get to enjoy a sunset. Those travelling in early spring will have the pleasure of seeing a spectacular array of colours as the desert flowers bloom. After crossing the border into Namibia, we head to our camp on the banks of the Orange River (also known as the Gariep River - the River of Hope), South Africa’s longest river. We pack our canoes and head off for downstream. Enjoy spectacular scenery as we as we leisurely drift along. Tonight we sleep under the stars. This is an evening to remember. The Orange River trip is definitely one of the highlights of this adventure tour. 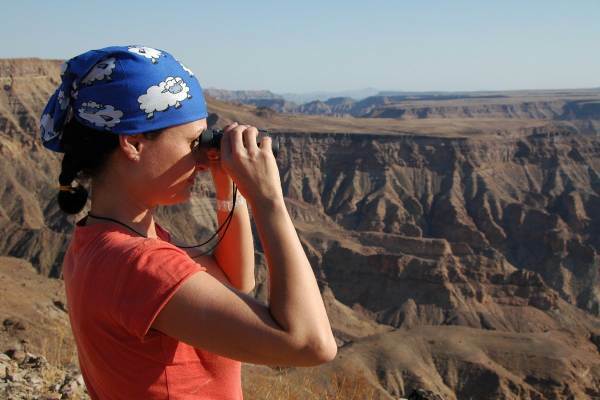 Leaving behind the river, we visit the Fish River canyon - The world’s second largest canyon. Enjoy amazing views as we visit the various viewing points. Leaving the Fish River Canyon we head to our camp in the Namib which is situated in private nature reserve. An opportunity to learn about life in the desert and enjo the open expanses of this unique area. Today is desert day. The Namib desert is a photographers dream. Contrasting colours, huge sand dunes, and unbelievable beauty. First stop is at Dune 45 - the more energetic have a chance to climb this massive dune. We board 4x4 vehicles and head further into the desert. Visit Sossusvlei and Deadvlei - a salt and clay pan surrounded by massive red dunes.. Exploring this unique area is a definite highlight of the tour. Leaving behind the dunes we head to Swakopmund - where we check into our lodge. Swakopmund is a popular destination for travellers and offers a range of coffee shops, restaurants and bars. A great place to relax after the harshness of the Namib. Relax on the beach, browse the local curio shops or get active. Swakopmund is the known as the Desert Adventure Capital and offers a range of activities including quad biking, sand boarding, skydiving and more. We head north along the Skeleton Coast, with its shipwrecks and desolated houses. We visit the Cape Cross - home to thousands of seals. After taking in this spectacle we head inland to the Spitzkoppe. A great place to explore with its huge granite boulders and ancient Bushmen paintings. Today we head to Etosha - Namibia’s largest game reserve. Arriving in the park we set up camp and head out on our first safari. Etosha Park is well known for its huge herds of elephants and predator cats, including lion and leopards. There is an abundance of animals and most are concentrated around the numerous waterholes. Etosha is also famous for its floodlite waterholes where one can spend the evening watching the animals come down to drink. Day 2 we spend the whole day enjoying the park and safari. Have your cameras handy. There is an option to book a night drive. We end our Etosha safari with a short drive to the gate. We head north and witness the rapidly changing landscape as we leave the arid south and enter the lush areas of the Okavango River. It is a long day as we travel past rural villages to our camp on the Okavango River. Today we pack overnight bags, board a motorboat and make our way deep into the delta. We meet up with our local “polers” who guide us through the waterways on “Makoros” - dug out canoes. We set up camp on a remote island from which we explore the surrounding area on foot and canoes. The Okavango Delta is one of Africa’s last true wilderness areas and is a must visit. One can expect to encounter animals, amazing flora and meet the local tribes people. Early morning we make our way back to our vehicle and head south to Maun. Maun is a frontier town and offer clients and opportunity to relax after the wilderness camp of the delta. We spend the night in a lodge. A leisurely start to the day before we head east to the spectacular Makgadikgadi Pans. The pans are known for there beauty and array of birdlife. There is also a chance of seeing desert animals.We head to our bush camp where we enjoy an evening under the stars. Star gazing on the pans is renown and expect to see plenty of shooting stars and satellites. (modern curse). Leaving behind the pans we head north to Chobe National Park. Chobe is well known for it’s huge herds of elephants as well as predators. In the afternoon we enjoy a classic Wildlife cruise down the river. You can expect to see a large number of elephants as well as numerous other animals coming down to drink. Being on the Chobe river allows for close up viewing -- have your cameras ready. Returning to our vehicle we head to Victoria Falls. Once we have crossed the border into Zimbabwe we base ourselves in the village of Victoria Falls. The lodge is centrally located and there is ample time to visit the numerous markets and curio shops. Vic Falls is definitely one of the highlights of the tour and an included visit to the falls allows one to get up close and get soaked with spray. The sheer size of the falls is impressive and one can spend hours taking in the view. 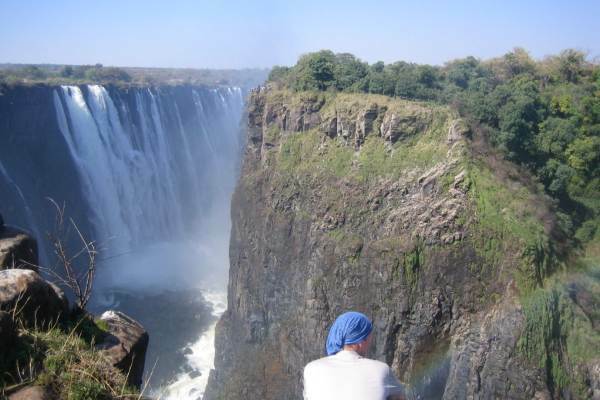 Victoria Falls is the “Adventure Capital of Africa” and their are numerous activities available. Bungee jumping and white water rafting are very popular. One could also spend time visiting a local village, cross into Zambia for the day or just relax in the village. Leaving behind Victoria Falls we head to Hwange - Zimbabwe’s largest national park. We enjoy an open vehicle safari and the local guides are bound to find an array of animals.We also do a short guided walk which allows us to experience the bush up close. 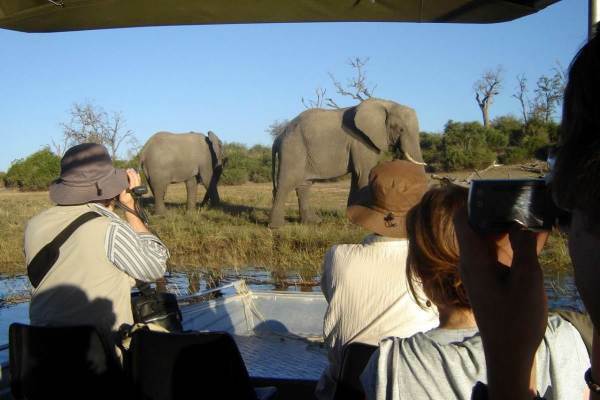 Hwange is home to the Big 5 and one can expect excellent animal sightings. The evening is spent at a campsite overlooking a popular waterhole teeming with animals. Travelling south, we pass through the town of Bulawayo (Zimbabwe’s second largest city). We set up camp at Matobo Hills - well known for its population of the highly endangered rhino. We have an opportunity to track and learn more about these incredible animals.The area is has unique boulder formations and is the place of Cecil John Rhodes grave - a controversial colonist. Leaving behind Zimbabwe we cross back into Botswana and set up camp in the Limpopo valley. We set up camp in a private game reserve and have time for a final short bush walk.